It used to be straightforward, this thing called music-obsessive syndrome. When I developed the condition in the late 1970s, you listened to the radio – WIFI, WMMR, WYSP, WIOQ, etc. – and if you heard a song you liked you trucked down to the Hatboro Music Store or up to Sam Goody in the Village Mall to buy the corresponding 45 or LP. In time you’d dig deeper into the scene via recommendations from friends, Creem and Rolling Stone magazines, maybe invest in a book – the red or blue music guides from Rolling Stone, for instance – to learn about historical recordings, and saved cash by heading to Memory Lane Records in Horsham, where the sheer mass of used vinyl was as overwhelming as it was joyful. Everything was new regardless of age – in 1978 when I was 13, for instance, the Beatles and Stones were as new to me as Dire Straits and Van Halen. Now? Most terrestrial music stations are accented by ultra-tight playlists, with those that highlight the new primarily doling out sound-alike hits and those that trade in nostalgia reducing the oeuvres of veteran acts to a handful of songs. A few exceptions exist, of course. WXPN, the best of the bunch in the Delaware Valley, features a rich mix of Americana, folk, blues and rock, but everytime I tune in they’re as likely to be playing the old (Steely Dan) as the new (Jessica Mayfield). Satellite radio, which I’m told is home to expansive playlists, requires a subscription and specialized equipment. Online radio and streaming sources abound as well, each with their own pluses and minuses. But how do you find what you don’t know you’re looking for? In my case, it’s actually not all that dissimilar to when I was a kid. While I rarely listen to the radio due to the depth of my collection, I still browse for hours in stores, though in lieu of Hatboro Music it’s now Amazon or iTunes. I listen to song samples, click on recommendations and, often, jump outside of their ecosystems to look up the act’s own website as well as concert clips on YouTube. I read Rolling Stone and the British music magazines Mojo and Uncut, and deep-dive back catalogs at Allmusic.com (the go-to site for such things). Mojo led me to one of my favorite artists of the past few years, in fact. In late 2010 I opened the magazine to find a glowing review of Seasons of My Soul, the debut album by a singer-songwriter called Rumer (real name: Sarah Joyce). It sounded like something up my alley, so I hopped online to do further research and discovered that the CD was only available in the States as a pricey import. Song samples weren’t available on Amazon, either, though links on her Web site led me to the official video for the song “Aretha” on YouTube. It blew me away. I ordered the album that same day. And, since the album wasn’t released in the States until last month, I’m glad I took the plunge. Seasons of My Soul is an atmospheric song cycle that’s teeming with soulful, knowing lyrics and melodies that wrap themselves around the heart, to say nothing of Rumer’s emotive, pitch-perfect vocals. It echoes the classic pop of Burt Bacharach and the Carpenters, yet moves past those inspirations by tackling themes not always associated with pop music. “On My Way Home,” for example, is about the grieving process, and several other songs echo loss of one sort or another. “Come to Me High,” on the other hand, is a lush, romantic ode, as is “Slow.” The intoxicating “Take Me As I Am” is – as she says in the clip – about pushing people away when you need them the most. Add in the aforementioned “Aretha” and such songs as “Thankful” and “Blackbird” and, to my mind, the album is a must for everyone’s collection. As some of the above clips illustrate, Rumer is also a wonderful live artist. Due to budget constraints, she toured the States these past few months with a stripped-down band – first playing before a sparse audience at the World Café Live Upstairs in October (four months before Seasons of My Soul was released here) and at the World Cafe Live Downstairs last month, before what looked to be a near sell-out. 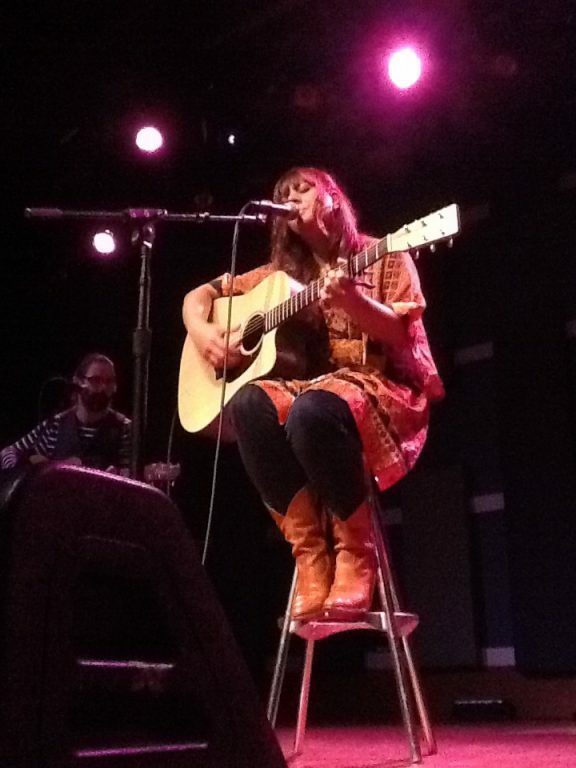 She has a knack for tackling cool covers in concert, too – Laura Nyro (one of her inspirations), Gil-Scott Heron and, this last time, two of Philly’s favorite sons, Hall & Oates. Anyway, in the weeks and months ahead, I hope to spotlight similar finds in this space. Some will be new, others not, but all will share this similarity with Rumer and Seasons of My Soul: they’re designed for the long haul.